Although full-blown marijuana remains illegal in most US states, cannabidiol (CBD) has gained recent popularity around the country. CBD is a non-intoxicating extract which comes from the plant’s flowers and buds. Many claim it helps with epileptic seizures, chronic pain, anxiety, and insomnia. 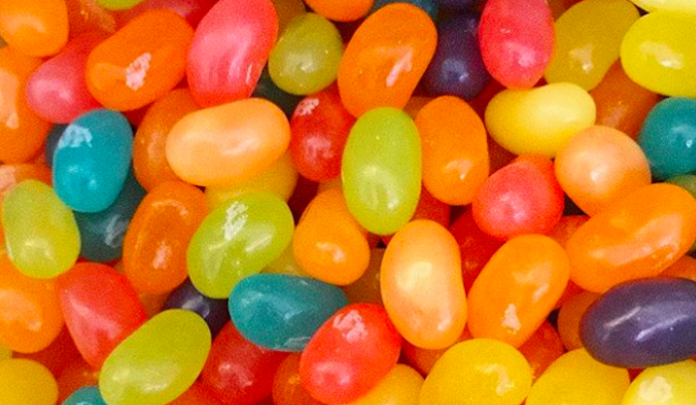 Consumers can obtain CBD in many ways: oil, topical lotions, vaping, and now… in jelly beans. David Klein, the inventor of Jelly Belly brand jelly beans, recently launched a new business called Spectrum Confections. The company’s purpose? To make jelly beans infused with CBD. Each bean contains 10 milligrams of cannabidiol. The beans, which come in 38 fun flavors, are available in bulk through the company’s website. The beans are also coated in dextrose or Malitol to help disguise the CBD flavor. Diabetics can enjoy the sweet treats since the beans also come in sugar-free varieties. According to their website, the company tests each recipe to ensure that the correct amount of cannabidiol is added to each bean. Spectrum also claims that it guarantees no THC, the intoxicating part of marijuana, is included in any of their flavors. While no other company is currently producing CBD jelly beans, Spectrum claims that some vendors are re-selling beans that they purchased in bulk. The price tag? Approximately $2/bean. The CBD market is on the rise, with many speculating that it will be a $16 billion market by 2025. It’s no surprise that business is booming. Between the anti-big-pharma push and the hunt for solutions to the opioid crisis, cannabidiol fits the bill of a holistic medicine. Many claim it treats chronic pain and other conditions that most people shell out serious cash for pills to treat. Medical marijuana is also gaining traction with cancer and terminally ill patients. What makes all this CBD talk even more exciting is that pharmacy superstore CVS has announced that they plan to start carrying CBD products in their stores, too. Could this be the beginning of something huge? What are your feelings on edibles and CBD products? Share your pot ponderings with us in the comments!